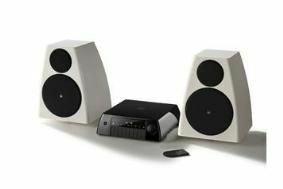 BRISTOL SHOW 2011: Meridian trio of compact digital products make their UK debut | What Hi-Fi? All three now make their UK debut here at the Bristol Sound & Vision Show this weekend. The Sooloos Media Core 200 digital media system is based around a 500GB hard drive that can store around 1000 CD albums in lossless quality. The system can be operated by any network-based control system, including an iPad or iPhone app, a computer running the Control PC or Control Mac app, or a Meridian Sooloos controller. And the Media Core 200 can be connected to the internet to listen to streamed audio services, including Rhapsody, as well as being synced with your iTunes library. Also joining the Meridian stable are the DSP3200 digital active speakers and Audio Core 200 stereo controller (pictured), costing £3750 and £1500 respectively. Full details of these in our original CES news report. In addition to its stand (Bristol 12) at the show, Meridian will also be running demos throughout the weekend at Sevenoaks Sound & Vision, 92b Whiteladies Road, Clifton, Bristol BS8 2QN.